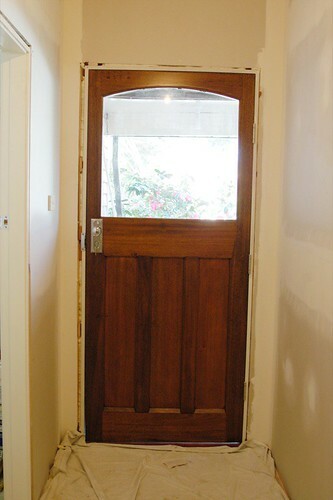 new/old solid blackbutt front door when it was first put in a few weeks ago. this hallway is all painted now, just needs the skirting boards and architraves put on. just a little note to say i'm still alive, still pregnant, still healthy and sleeping better, just feeling a bit quiet lately, like i don't have much new to share... we're getting close to finishing up the front renos and should be able to move some furniture into the nursery this weekend or early next week. the built-in robes won't have doors on them but everything else should be finito, which is pretty damn exciting. the house is such a mess right now with painting going on and random baby stuff littering every surface, it's not inspiring me do any photo shoots and that's probably a big part of the reason i haven't been blogging. i decided to work half days this week to help out a bit at work so next week will be my first official week off (with only 3 weeks until d day at that point) - should coincide nicely with decorating and finishing touches. hope you're all well and happy, wherever you are! Your front door looks great! and I can't wait to see the nursery coming together. So exciting!! If you're feeling up to it, do you want to try to catch up before d date? a little fabric shopping perhaps? ... I have two new japanese childrens pattern books arriving this week? ... anyway, let me know. I can't believe you will be delivering soon! Seems as though the pregnancy has gone by quickly. Savor your time right now and catch a few naps too!